I am writing about these most popular Temples of Kashmir, in a sequence, situated as per it’s altitude. So as per the altitude, the first one comes AMARNATH CAVE, then SANKARACHARYA Temple, KHREW, HARI-PARBAT, ZESTHA DEVI, KHEER BHAWANI, MATTAN, NAGBAL, (in ANATHNAG CITY) and then the last one comes SHARDHA DEVI TEMPLE , now In (POK). To plan a pilgrimage for "Amarnath Linga Darshan", two most important things every one must remember that first of all carry only BSNL mobile network hand sets, because no other mobile network service works near the Amarnath Cave. 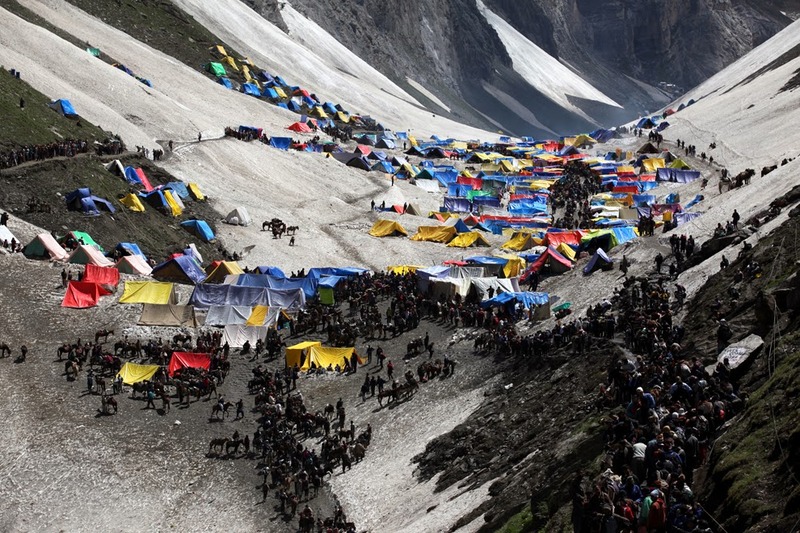 The Second point to remember is that to go to Amarnath cave, because of the security reasons, come what may, you have to obtain a permit by registering yourself at Jammu city itself. 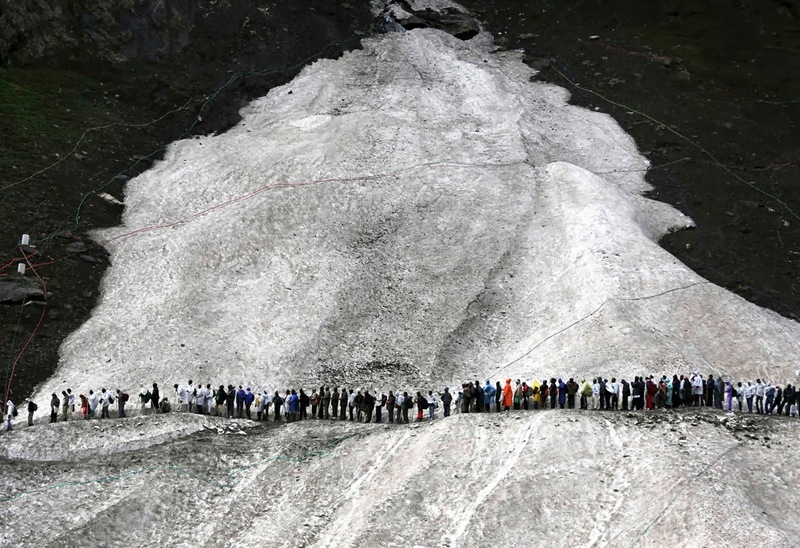 Without the permit no one is allowed to go to Amarnath cave. 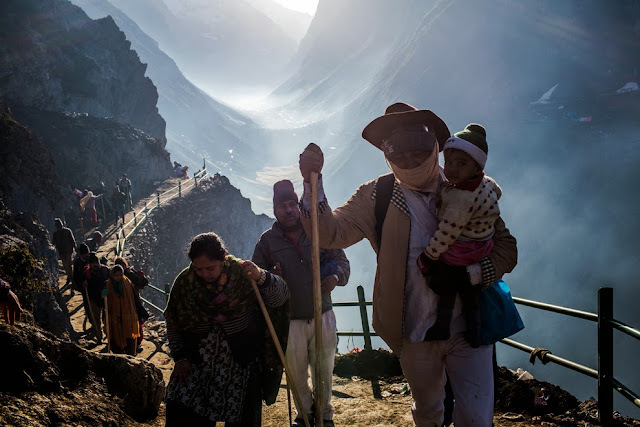 At Phlegm and at Baltal itself the security personal would check your permits and only after the verification they allow you to proceed further for the Darshan. If there is any discrepancy, security personal will refuse your entery. So, to avoid confusion make sure that while obtaining the permit you must give perfect required details about yourself. 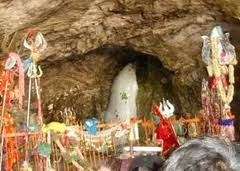 The very first time I performed Darshan of the “Shiv Lainagum” at the Amarnath cave, was back in 1972. That time my eldest Sister “Krishna Hassia’s” husband Mr. Chaman Lal Raina (Hassia) was posted as an engineer at GUND, near Kangan, Kashmir. During that trip a very funny incident happened. Those days via Baltal, only local pilgrims would go to the Amarnath cave. So, few of the Kashmiri Pandit employees and their families from Kangan and Gund decided to go in a group. That night all of the group members halted within a thick forest at Baltal. At the mid of the night there was a sudden commotion and all most all the ladies were screaming and howling in unison saying that they saw a rugged black Himalayan Beer coming towards the area where the ladies were sleeping. So to shoo away the Black bear, every single male member of the group, in a panic started running amok in all the possible directions with torch lights and were making all sorts of scarred noises. Hearing so much noises and commotions, suddenly there was a loud sound of squeaking wimps. In excitement every one focused the beam of the lights in the direction of the whimpering sound. Imagine the anticlimax scene when everyone saw that it was not a black bear but a huge black furry “Bakarwali Dog” who would have sneaked in to eat the leftover food items. Seeing the whimpering dog, with its tail bend in between his hind legs, every one busted out in to a big laugh. Even till today whenever any of that group member meets, we talk less of Amarnath Lingam Darshan but discuss more hilariously that how all of us got fooled. Now it’s sounds funny, but believe me that particular moment when we heard that it was supposed to be a ferocious Black Bear, every single person, whatever gender it may have been, started shitting Bricks. Till year before last year (till July 2011), without fail, every year continuously I had been going for the Amarnath Cave Lingam darshan. 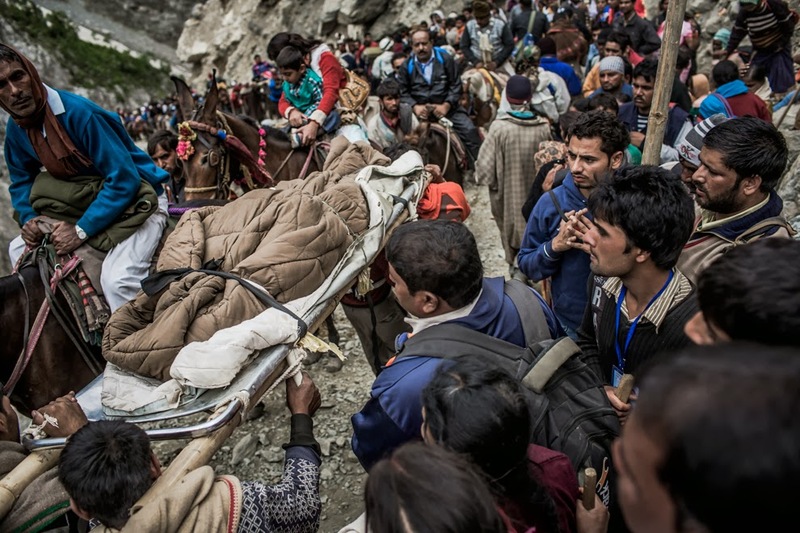 So the total number of times I had been to Amarnath Cave is eight times. There are two different routes to go to Amarnath cave. One is via Phlegm and another one is via Baltal. At Baltal as well as at Phlegm to stay there are two types of TENT facilities available. 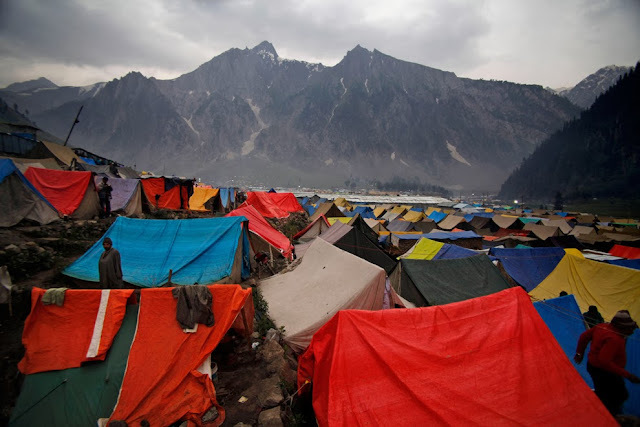 One are Paid Tents, those who charge you about Rs.500/- to Rs. 600/- per night, but provide you with hot water for bathing, fresh clean bed sheets, cozy blankets and a clean toilets. Whereas the other types of Tents are those who charge about Rs.75/- to Rs.100/- per person per night. In those tents they put about 5 to 6 persons in each tent and they provide you nothing other than the dirty beddings. Then there are “LANGARS” who provide you with free mass accommodation, free blankets, and free food. “LANGARS” are fully fledged mass staying set up organized by social organizations who come from different states of India. Organizing a “LANGAR” is just a way of rituals to show humbleness, humility and do free service to the community without being arrogant. From Baltal as well as from Phlegm there are three ways of travelling towards the Amarnath Cave. One is by foot, second one is by ponies and the third one is by Helicopter. To go by Helicopter, because of the heavy rush of pilgrims, you have to book “ON LINE” your seats very well in advance. By Helicopter it takes only 6 minutes to go and 6 minutes to come back. But the Helipad is at “Panjtarni” which is about 4Km from the cave. From “Panjtarni” you have to avail pony service for which you have to pay separate, (its not included in your helicopter fare). 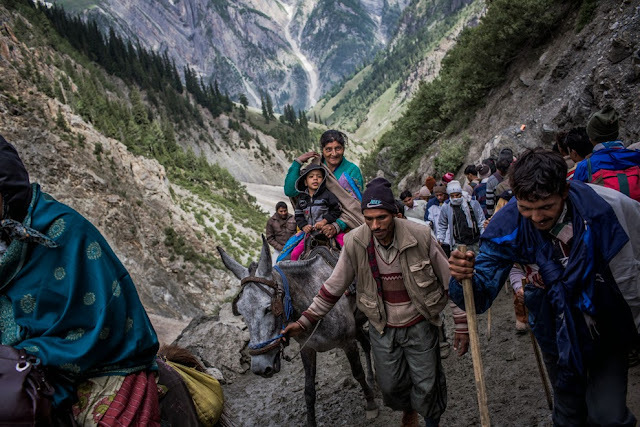 Amarnath: History records that the first pilgrimage to Amarnath was undertaken in 1000 BC, though little else is known of the antiquity of Amarnath. Located 141 km from Srinagar, of which 45 km from Amalgam has to be trekked, Amarnath is believed to be the one of the holiest of Hindu shrines. 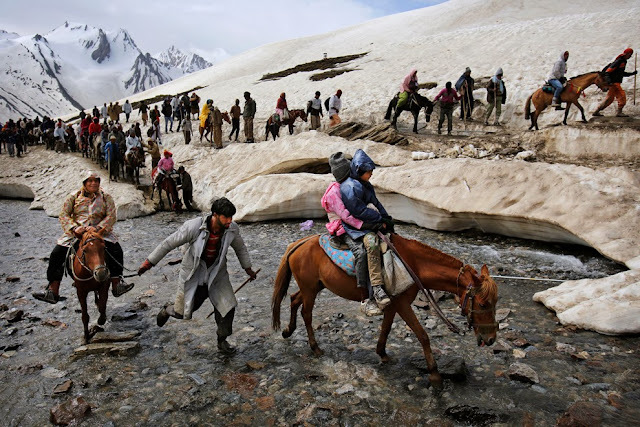 The Amarnath Yatra is undertaken in July-August (Shravan) and Lakhs of devotees walk, some on pony back, to pay obeisance at the cave where an ice-lingam, that of Shiva, waxes and wanes with the moon. By its side are two other ice lingams, those of Parvati, and their son, Ganesha. The cave is situated at an altitude of 3,888 m (12,756 ft), Inside the 40 m (130 ft) high Amarnath cave, the stalagmite is formed due to freezing of water drops that fall from the roof of the cave on to the floor and grows up vertically from the cave floor. It is considered to be a Shiv Linga by Hindus.The Cave waxes during May to August, as snow melts in the Himalayas above the cave and the resultant water seeps into the rocks that form the cave and gradually wanes thereafter. [ As per the religious beliefs, it has been claimed that the lingam grows and shrinks with the phases of the moon reaching its height during the summer festival, although there is no scientific evidence for this belief. According to a Hindu legend, this is the cave where Shiva explained the secret of life and eternity to his divine consort, Parvati. Two other ice mound formations next to each other represent Parvati and Shiva's son, Ganesha. 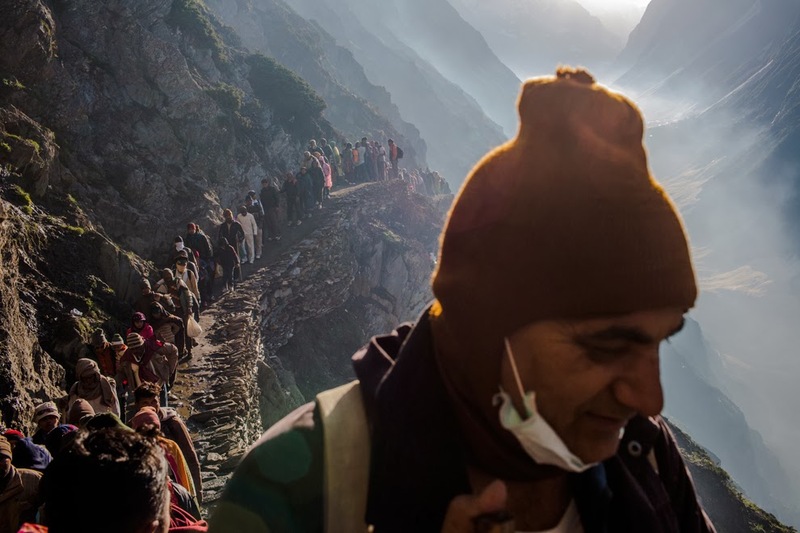 The temple is a popular Yatra destination for only Hindus. 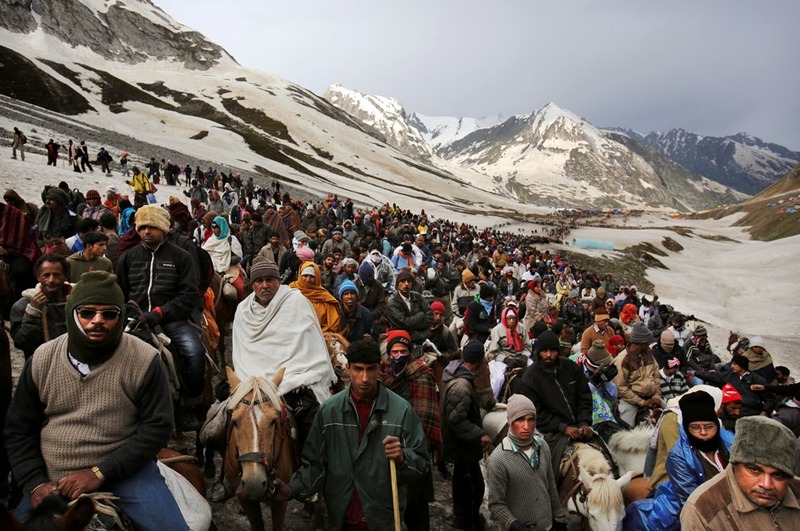 Pilgrims visit the holy site during the 45-day season around the festival of Shravani Mela in July–August, coinciding with the Hindu holy month of Shraavana.The beginning of the annual pilgrimage, called Amarnath Yatra is marked by 'pratham pujan' to invoke the blessings of Shri Amarnathji. 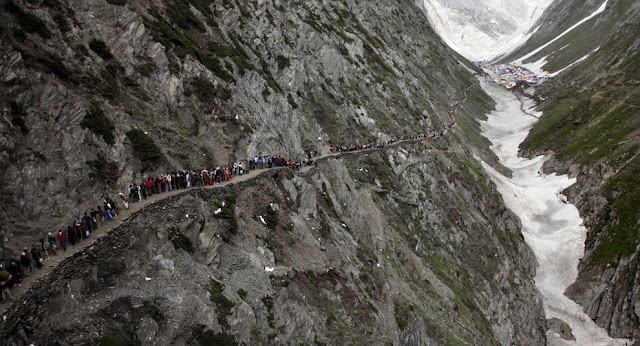 Devotees travel on foot from Amalgam The latter journey takes approximately 5 days. The shorter northern route is just about 16 km long, but has a very steep gradient and is quite difficult to climb. It starts from Baltal and passes through Domial, Barari, and Sangam to reach the cave. 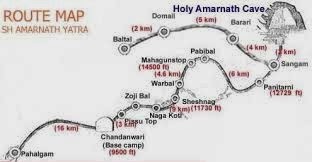 The northern route is along the Amarnath valley and all along the route one can see the river Amaravathy (It is more like a tributary of Chenab) which originates from Amarnath Glacier. It is believed that Lord Shiva left Nandi, The Bull, at Amalgam (Bail Gaon). At Chandanwari, he released the Moon from his hair (Jataon). On the banks of Lake Sheshnag, he released his snakes. At Mahagunas Parvat (Mahaganesh Mountain), he left his son Lord Ganesha. At Panjtarni, Lord Shiva left behind the five elements - Earth, Water, Air, Fire and Sky. As a symbol of sacrificing the earthly world, Lord Shiva performed the Tandava Dance. Then, finally, Lord Shiva entered the Holy Amarnath Cave along with Parvati. The Amarnath cave has been a place of worship since times immemorial. There are references to the legendary king Aryaraja (ascribed dates 300 BCE who used to worship a lingam formed of ice in Kashmir. The book Rajatarangini (Book VII v.183) refers to Amareshwara or Amarnath. It is believed that Queen Suryamathi in the 11th century AD gifted trishuls, banalingas and other sacred emblems to this temple. 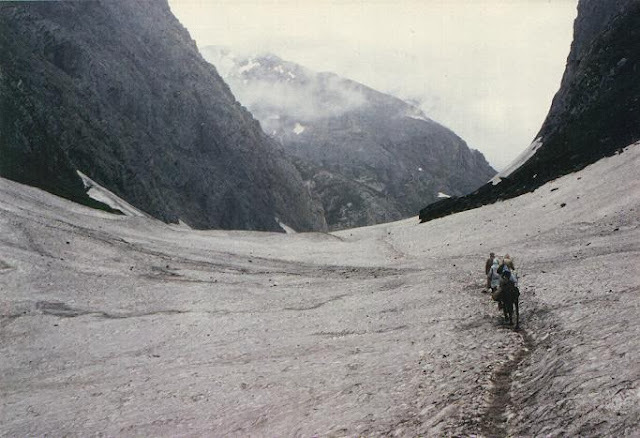 Rajavalipataka, begun by Prjayabhatta has detailed references to the pilgrimage to Amarnath Cave. Other than this, there are further references to this pilgrimage in many other ancient texts. It is believed that after the Middle Ages, this cave was forgotten by people before it was rediscovered by a Bakarwal-shepherd, whose family surname is MALIK, in the 15th century once again. Till today that MALIK family TREE has a percentage of shares, collected from the offerings of pilgrim’s offerings. Another story relates to Bhrigu Muni. Long time ago it is believed that The Vale of Kashmir was submerged under water and Kashyapa Muni drained it through a series of rivers and rivulets. Therefore when the waters drained, Bhrigu Muni was the first to have Darshan of Lord Amarnath. Thereafter, when people heard of the Lingam, it became an abode of Lord Bholenath for all believers and a pilgrimage which is done by lakhs of people each year. Kashmir for centuries has enticed invaders and saints alike. The former invaded it for its unmatched natural beauty. The saints came to attain spiritual bliss. That is perhaps what attracted Adi Shankara Acharya to the valley over a millennium ago. The ancient Sankaracharya Temple, also known as the “JYEST-ESWARA “TEMPLE”, is found on top of the hill called as “Takht-i-Sulaiman” or "Throne of Solomon", at the height of 350mt / 11,000 feet. Overlooking the Dal Lake and Srinagar city, Adi Shankaracharya (788-820AC) lived, meditated and did Tapas (penance) here to review Hinduism which had been eclipsed by Buddhism. 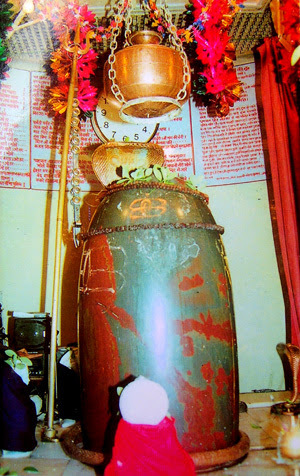 He worshipped the “Shiva Lingam”, which is still found in the Sanctum Sanctorum of the temple. The temple was built by Jalauka, the son of the great Emperor Ashoka, about 200 B.C. King Gopadatta of Kashmir who ruled from 79 to 109AD, rebuilt it and dedicated the temple to “JYESTESWARA”. The hill was called Gopadri and the village at its foot on the south is still called Gopkar. 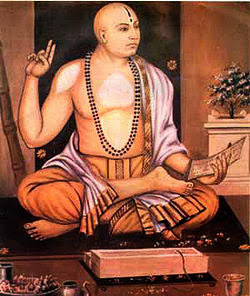 Shankara Acharya’s primary aim was to establish a mutt in Kashmir. But he was equally motivated by a desire to visit the “Sharada temple” of Kashmir. 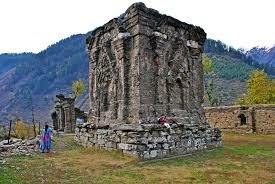 The temple, which is now in ruins, is located in Shardi, a small village on the banks of the Kishanganga River in Pakistan-occupied-Kashmir. 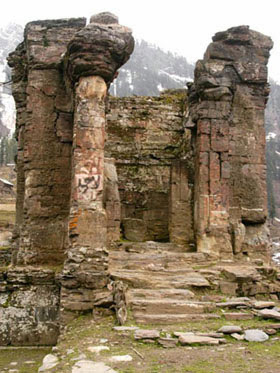 For centuries, the temple was considered a high seat of learning by Hindu scholars outside Kashmir. Even today, orthodox Hindus in south India bow facing north, towards the temple, when they rise in the morning. 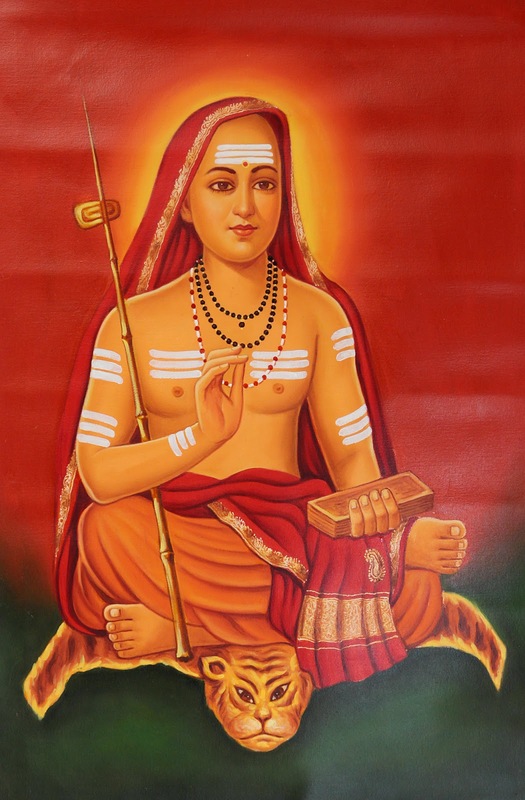 Shankara Acharya is believed to be the only scholar from South India who visited the temple and entered “Sarvajna Peetham” after defeating scholars in a debate. The temple had four doors for scholars from the four cardinal directions. Till Shankara Acharya visited the place, the southern door had remained closed—no scholar from south India had ever entered the Sarvajna Peetha till Sankara Acharya came. Shankara Acharya abandoned the plan to establish a mutt in Srinagar after a debate with the Kashmiri Pandits of that time. 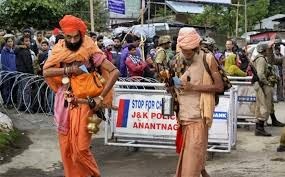 The Pandits had initially stopped his entry into Srinagar, as they took umbrage to the idea of an outsider coming to teach them about religion. 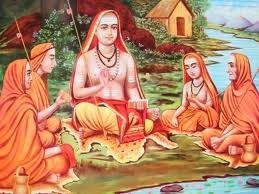 They disapproved of Shankara’s idea of establishing a mutt and arranged a debate with him. 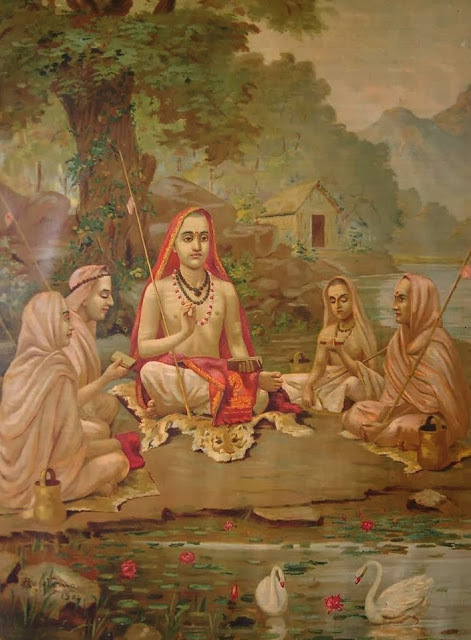 Shankara Acharya was so impressed with their knowledge of religion, especially Shaivism, that he realised there was no need for establishing a mutt in Kashmir. Later, Shankara Acharya was ceremoniously ushered into the city of Srinagar by the Pandits. The best thing is that Kashmiri Pandits had mastered almost all the different Hindu religious teachings, but has never ever contributed any of their own created “Gyan” to any of the Hindu religions. Shankara Acharya immortalised his experience in Srinagar with a famous prayer to Saraswati. The beginning verse is as follows: NAMASTE SHARADE DEVI KASHMIRA PURAVASINI, TAVAHAM PRARTHAYE, NITYAM VIDYA DANAM CHA DEHI MAE… (Obeisance to thee, O effulgent Sharada, worshipped in the city of Kashmir, I always beseech thee to vouchsafe to me pure knowledge). Shankara Acharya, however, stayed at the famous Shankaracharya temple located on the top of an 11,000ft high hill overlooking the Dal Lake and most of Srinagar city. The local people also call it Takht-i-Sulaiman, a reference to the throne of Jewish king Solomon. Inscriptions on the stairs, leading up to the shrine supports this notion. Scriptures and other indications proves beyond doubt that It is very likely that both Jesus Christ (and his disciple Thomas) had been to Srinagar and maybe even lived there for a while. As Srinagar in those days was a very important religious and cultural center. Jesus’s burial at the Rozabal Mausolaeum also indicates that he had a strong connection to this particular place. The temple, devoted to Lord Shiva, was built in 2605-2540 BC by King Sandhiman of the Gonanda dynasty, who named it Jeshteshwara. The hillock came to be known as Sandhiman Parbat. Later, King Gopadityas repaired the temple and donated two villages, Gupkar and Buchhwara, to the temple. The hillock was given the name Gopadari, or Gopa Hill. The name Gopadari and Jeshteshwara stayed till the temple was dedicated to the memory of Shankara, who had stayed at the temple complex around AD 800, observing penance to attain spiritual wisdom. It was after completion of penance here that Shankara founded the four dhams. Short distance from the temple there are some graves hidden in the grass. These are supposedly the graves of Hebrew artisans employed by Sulaiman in repairing this temple. With the permission of the present shrine board on the temple premises reads the temple was constructed by Pandavas in 5 BC and completed by Maharaja Gopaditya.The Big Shivling in the temple was installed by the Dogra ruler Maharaja Pratap Singh. Inside, the temple is shaped like a Shivling. Popularly called Zaalaa Bagvatii, the Shrine of Mata Jawalaji at Khrew is one of the ancient Shrines of Kashmir. The Shrine is on top of a triangular hill overlooking the entire beautiful panoramic view of Khrew and its surrounding village. From the Eastern side, to reach the santisnatorium of the temple we have to climb on foot, 350 flight of steep stone steps to reach to the temple, Now a days, cars can come right upto the very first step of the climb to temple. 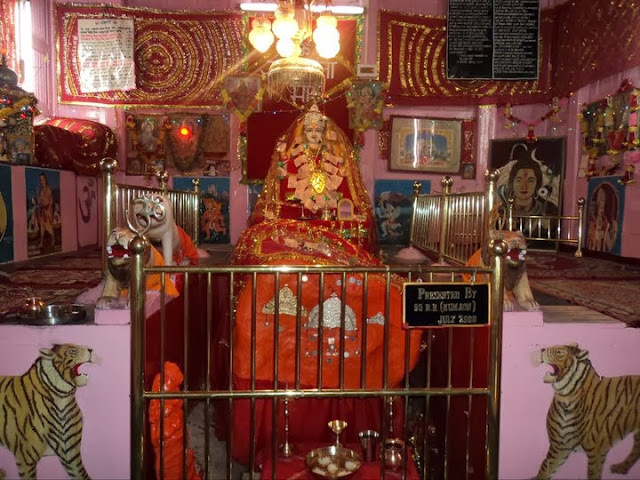 It is a temple which is dedicated to Jawala Bhagwati - the Goddess of fire. Mela Jawala Mukhi is held here annually on the 14th day of the bright fortnight of Savan (July–August) when pilgrims visit this shrine from all corners of the country. Till recentlry Army was performing the daily pooja at the temple. But recently few families of Kashmiri Panditjis have come down to Khrew and they perform the daily Pooja. 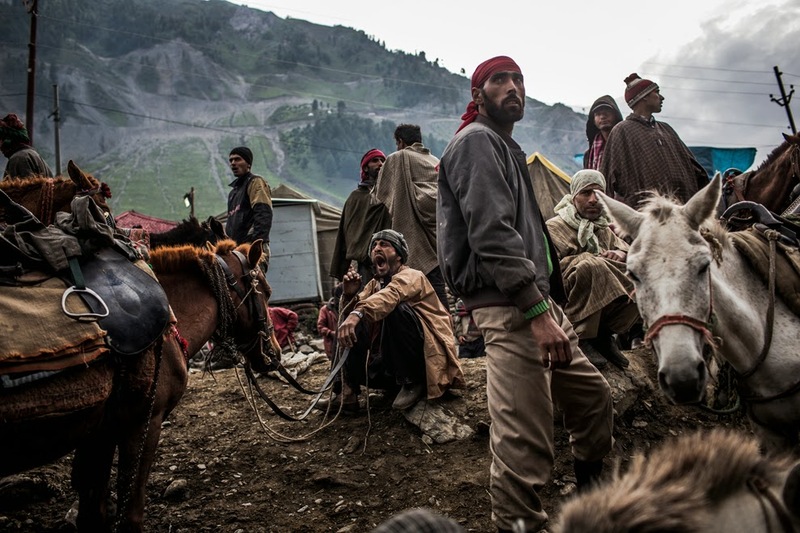 For the security reasons of the town and the temple, the regular baraks of Amry personal, is still there. 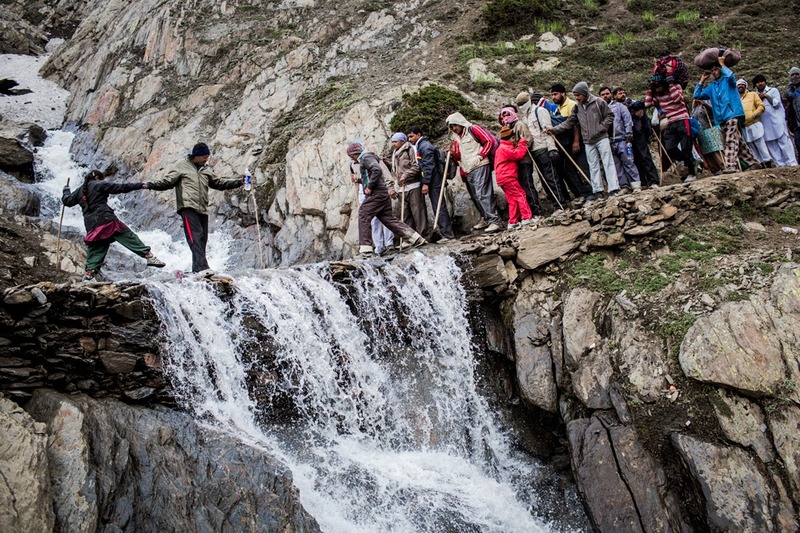 At bottom of the hillock is a spring where people take a dip before making the ascent. Khrew had a history of having 333 natural springs but currently, only 7 springs flow through this town. Once known for their crystal clear waters, these waterbodies have lost their tradional stature due to the unchecked pollution emanating from various cement factories rendering these springs stagnant and lifeless. 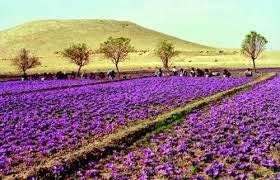 Khrew is the best producer of saffron. The costly spice of the world. 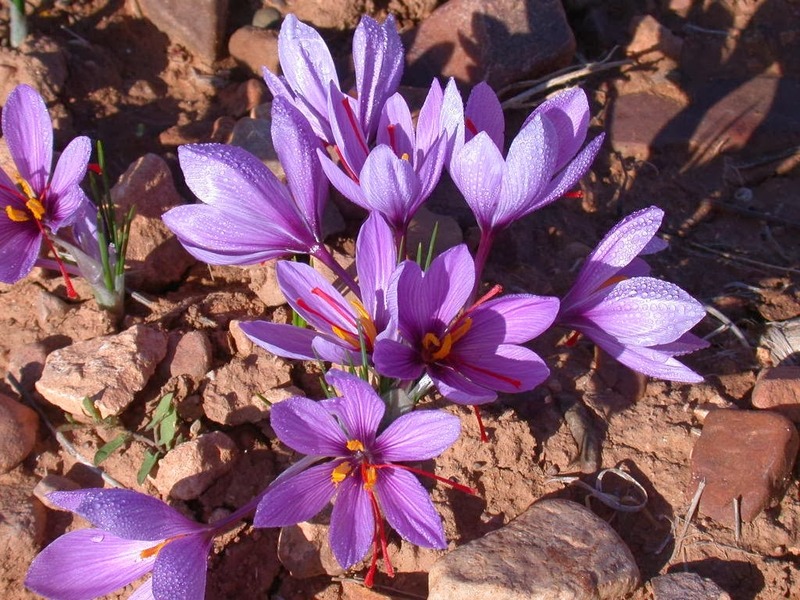 According to survey by agriculture departments Khrew is the fourth cultivator of saffron in India. 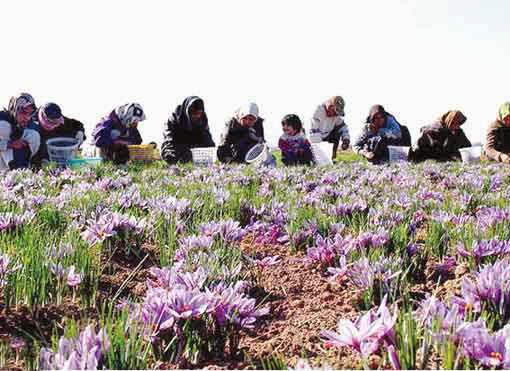 The estimation given by (The saffron dealer of khrew) "Khrew has a capability to grow miniumum 385KG of saffron in a year" up to 2004 we were dealing up to 248 kg of saffron in a year but the problem occurred by these cement industries have shown great decline in this cultivation. 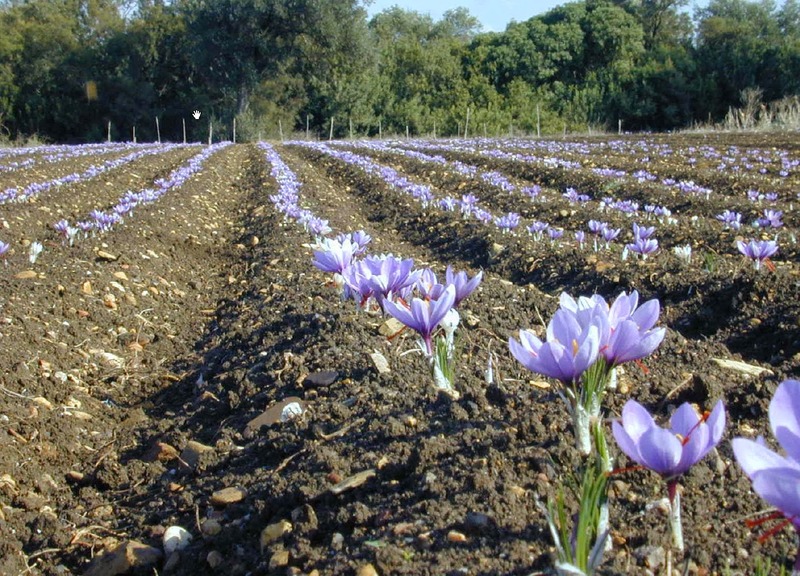 In 2010 we have not done deal of saffron more than 73 kg. Which is showing that the loss of capacity to grow in land by the chemicals and dust. Next holy spot on parikrama of Hari-Parbat is the "thapna" of `Hari', represented by a rock (shila), located on the north-eastern face of the hillock. The shila is also smeared with sindhoor. Earlier a small dharamshalla used to exist near this thapna. The devotees after performing pooja at this spot, take a symbolic `round-turn' parikrama in front of the shila, pronouncing loudly the holy words "Hari (Maujee) Kartum Yari" (The Mother Goddess bless me). Now days to reach Hari Parbat sanctum sanatorium. We have to climb nearly 200 stone slab steep steps. Hari Parbat Fort: To the west of the Dal lies the Hari Parbat Hill, sacred to the Goddess Sharika in whose honor a temple has been consecrated on the western slopes of the hill. Further up, on the crest of the hill is Hari Parhat Fort which dates to the 18th century. Hari Parbat also known as Koh-e-Maraan is a hill overlooking Srinagar, the largest city and summer capital of Jammu & Kashmir. 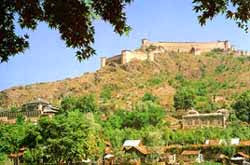 It is the site of a Durrani fort, built in 1808. It has the famous Shakti Temple on the western Slope and Muslim shrines of Khwaja Makhdoom Sahib and Akhund Mullah Shah on the southern slope. On the southern side of the outer wall there is a Gurudwara, which commemorates the visit of Guru Hargobin ji. The first fortifications on the site were constructed by the Mughal emperor Akbar in 1590. He built an outer wall for the fort, and planned a new capital called Nager Nagor to be built within the wall. That project was never completed. The present fort was built in 1808 under the reign of Shuja Shah Durrani. The hill is considered sacred by the Kashmiri Pandits due to the presence of temple of Sharika. Temple is of goddess Jagadamba Sharika Bhagwati. She has 18 arms and is regarded as the presiding deity (`isht`-Devi) of Srinagar city. The goddess is represented by a Swyambhu Shrichakra (Mahamaha Shrichakra), also called Mahashriyantra, which consists of circular mystic impressions and triangular patterns with a dot (bindu) at the center. Sharika Devi is believed to be a form of Durga Mata or Shakti. According to legend, the Hari Parbat hill was once a huge lake inhabited by the demon Jalobhava. The inhabitants called on the goddess Parvati for help. She took the form of a bird and dropped a pebble on the demon's head, which grew larger and larger until it crushed the demon. Hari Parbat is revered as that pebble, and is said to have become the home for all the gods of the Hindu pantheon. Another version of the myth says that two demons, Tsand and Mond, occupied the fair valley. Tsand hid in the water near the present location of Hari Parbat and Mond somewhere above the present Dal Gate, and both terrorized the people of the valley. The gods invoked Parvati who assumed the form of a Haer (myna) and flew to Sumer, picked up a pebble in her beak, and threw it on the demon Tsand to crush him. The pebble grew into a mountain. Hence was named Hari (myna) Parbhat. 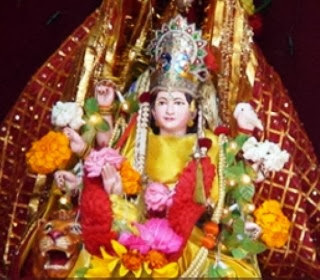 Parvati is worshipped as Sharika in Shri Tsakra (an emblem of cosmic energy pervading the universe) occupying the middle part of the western slope of the hill. The hill is also called Predemna Peet. 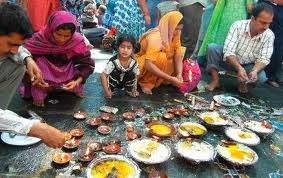 On the birthday of Sharika Bhagwati, the devotees make a sacrificial offering of `Taher-charvan' (Taher - rice boiled with turmeric powder and mixed with oil and salt; "charvan" - cooked liver of goat) to the goddess. This day is celebrated as Har Navum. The rooms in the Zestha Devi temple complexes have to be booked well in advance. There is a Zeshta devi temple website for the room bookings. Since there are only 20 to 25 rooms and almost all the Kashmiri Pandits from all over the world,who throng Srinagar during summer, can’t just walk in and get a room. Since the rooms are limited, so online booking is a must. There are dormitories also. Dormitories can accommodate round about 30 people and every one has to go out for washrooms and toilets. It’s nearly 30 Km from Srinagar city. 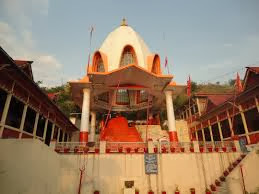 Kheer Bhawani: Goddess Ragnya Devi is worshipped here, symbolised by a sacred spring at Tula Mula village. In the centre of the spring is a small marble temple and the Hindu inhabitants of Srinagar fast and converge at the spot on the eighth day of the full moon in the month of May ( Called as Zetattam) when legend has it, the goddess changes the color of the waters. Kheer Bhawani is a temple dedicated to the Goddess Kheer Bhawani (originally just Bhawani) constructed over a sacred spring .The worship of Kheer Bhawani is universal among the Hindus of Kashmir. The term kheer refers to sweet rice pudding that is offered in the spring to propitiate the Goddess, which became part of the name of the temple. 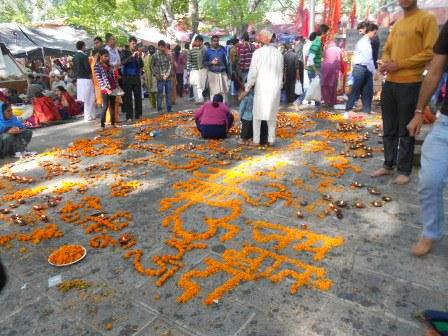 Kheer Bhawani is also called as “Tul-Mul”. In Kashmiri language Tul means Millbury tree and Mul means root of a tree. That means the sanctum sanatorium of the Goddess is seated on a Stem (root) of the Mulberry tree. As is the custom with Hindu deities, she has many names: Maharagya Devi, Ragnya Devi, Rajni, Ragnya Bhagwati, and so on. The Kashmiri devotees often say this mantra in their morning prayer- "Namaste Sharada Devi Kashmir purvasini Twamham prartheye nityam Vidya daanam che de hi me" meaning "I owe my full gratitude to the great goddess Sharada who lives in Kashmir I request you to fill in my mind with utmost power of concentration and studies"
Caption = Changing colours of the divine spring, It is the most important temple for the followers of Historical Vedic Religion in Kashmir, known as the Kashmiri Pandits. Around the temple is an area covered with smooth and beautiful stones. In it are large, old-growth Chinar trees beneath which the pilgrims sit or sleep on mats of grass. While most of the colours do not have any particular significance, the colour of the spring water changes occasionally. 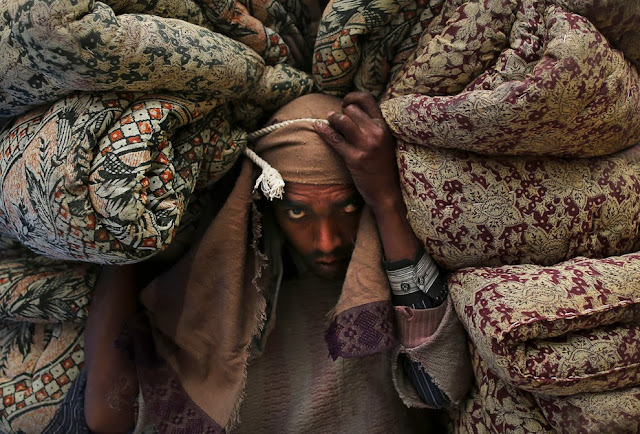 When black or darkish, it’s believed to be an indication of inauspicious times for Kashmir. In 1886, Walter Lawrence, the-then British settlement commissioner for land, during his visit to the spring, reported the water of the spring to have a violet tinge. Even in during 1886 some disastrous calamity had taken place. Maharagya was pleased with the devotion of Ravana and appeared before him and Ravana got an image of the Goddess installed in Sri Lanka. However, the Goddess became displeased with the vicious and licentious life of Ravana and so didn't want to stay in Sri Lanka. Therefore, she is believed to have instructed Lord Hanuman to get the image from Sri Lanka and install it at the holy spot of Tula Mulla. The mention of Kheer Bhawani is found in Kathana’s Rajtarngini . Kalhana writes that the sacred spring of Tula Mula is situated in a marshy ground. The name of the spring is Mata Ragini Kund(pond). Maharagini is the form of Durga Bhagvati. The Brahmins of Kashmir worship this spring and pilgrims from every comer of the country visit to have the darshan of the place. In Rajtarangini, Tula Mula and the spring of Maharagya has been considered very sacred and the Brahmins of Tula Mula considered notable for their spiritual prowess. Thousands of years ago, many floods occurred in Kashmir and the sacred spring of Tula Mula was inundated under its sway and the holy place could nowhere be traced. At last, Kashmir's Yogi Krishna Pandit had a dream in which the Goddess appeared to him and directed that she would swim in the form of a snake at the proper place and that he should stick large poles to demarcate the holy spot in the marsh land. Subsequently, when the water subsided there the holy spot was discovered. This event happened during the Samvat 4041 (Hindu lunar date). In the past, with incessant offering of milk and sugar candy in the spring by pilgrims, a thick layer of offerings had accumulated at its base. When it was cleared, the ruins of an old temple and shrine slabs engraved with figures were discovered. Here many images were also found but nobody rebuilt the temple till the Samvat 1969 (Hindu lunar date) when Maharaja Pratap Singh who was the disciple of the Goddess, got a temple of marble made in the midst of the spring which shines like a pearl in a shell. The marble temple was completed in 1920s. Some people are of the opinion that there was a mulberry tree near holy spot of Kheer Bhawani which, in local language, is called tul mul. But tul mul is also derived from the Sanskrit word atulya mulya meaning great value. It is believed that Ravana, after his worship of the Goddess, offered her kheer (rice pudding), which she accepted and since then it is called Kheer Bhawani. 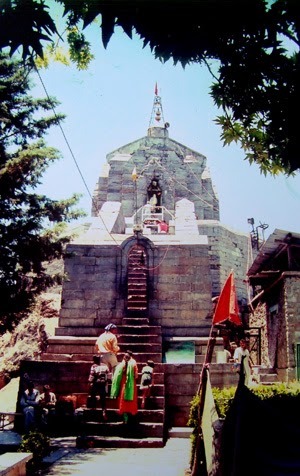 Mattan temple is situated on the Anantnag-Pahalgam Road. Its 62 Km from Srinagar. And the village of Mattan is in Distt Anantnag. This a Sun God “MARTHAND” temple WHERE THE SACRED CEREMONIES ARE HELD TO PROPITIATE THE DEAD. It’s a holy temple where the last rites of dead hindus are performed. 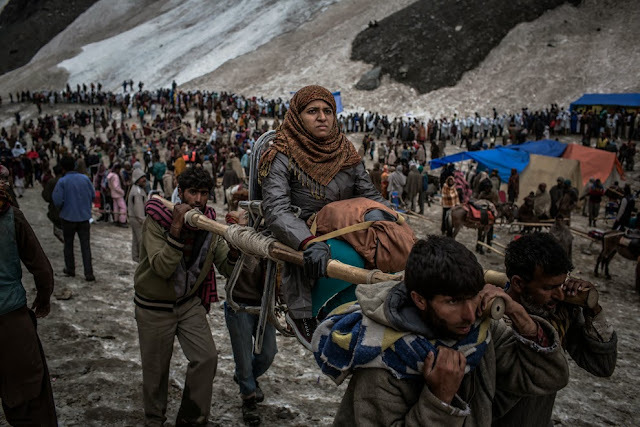 In olden days because of the inaccesable roads, Hindu famalies from Kashmir could not travel to Haridawar or Rishikesh to perform the last rites of dead Hindus. So the temple of Mattan and its perennial springs, is as sacred and as holy as Ganges water at Haridawar or Rishikesh. 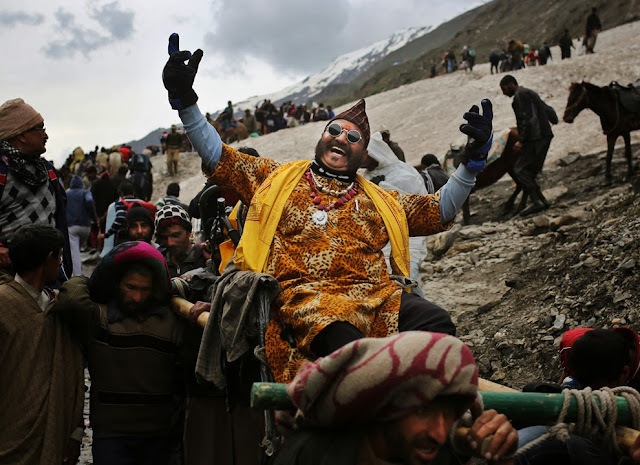 The Pandit families who perform the rituals of last rites, have generations old records of all most of all the Kashmiri Pandit famalies who would have got on some time or the other the rast rites performed. Once you go to Mattan temple, they The temple Prohits will tell you the datails of your whole ancestral family tree. Basically it’s a temple dedicated to “Sun God” called as Marthand. Now the temple Board have added Rama, Laxman and Sita temple plus Goddess Laxmi and Sawsati temple and also Radha Krishna temple in to this temple complex. There are two crestal clear perennial water ponds. First one is just a spring which is completely enclosed with a metal bricade so that devotes don’t dirty it. The second pond is a huge pond which is full of thousands of black cat-fish. These fisheses are fed by devotees with raw rice and black gram channa, which is sold by in a near by shacks next to the water pond. In the centre of the secong pond there is a raised cemented structure within which a big “Shiv-Ling” is erected. Other than the top side of the raised structure is covered, whre as all the surrounding other four sides are open so that devotees can pray while seeing at “Shiv-Ling” from any angle. To perform pooja to the “Shiv-Ling” the Poojari has to swim to reach the Shiv-Linga’s cemented structure. Imagine during severe winter how that Poojari would be swimming in almost freezing cold water. "ONE MAY READ THOUSAND OF BOOKS WITH CART LOAD OF BOOKS TO FOLLOW. ONE MAY STUDY ENUMERABLE EPICS OR FILLS, ONE CELLARS WITH VOLUME OF STUDY, ONE MAY READ FOR GENERATIONS & GENERATIONS,AND SPEND EVERY MONTH IN THE YEAR STUDYING & ONE MAY READ ON ENTIRE LIFE, RIGHT UPTO ONE'S LAST BREATH SAYS NANAK, THERE IS ONE TRUTH HIS NAME ONLY, ALL ELSE IS VANITY EGOISTIC MIND"
When Pandit Brahm Das listened this, he fell on GURU SAHIB's feet.GURU SAHIB stayed for few days at Pandit Brahm Das's residence. A Muslim Saint also discussed religious aspect with GURU SAHIB. Mattan was site famous for the ruins of temples. Sardara Hari Singh Nalwa constructed Seven Gurudwara Sahib's on the twin side of Springs, in which SHRI GURU GRANTH SAHIB were installed. These GURUDWARA SAHIB were removed in Dogra Rule in 1905-1909. There is a provision of temple kitchen where morning tea, lunch and dinner are served free of cost by the temple authority. On the main road just adjustant to the temple complex, there are two Kashmiri Pandits “Kandurs” shops who bake fresh “Kandu Choot, Kulchas, Lawasas, Geerdas and Baker Khanis”. So for the break fast and evening tiffe we can buy these baked items and have with the tea that is served free at the temple kitchen. This year July-2013, because of a sudden strike in Kashmir, the (bundh call was given by separatist group) along with another 100 devotees, my elder brother G.L.Parimoo and me got stranded at the Mattan temple for almost four days. But believe me, we enjoyed our stay at Mattan temple. The temple management board has made an excellent arrangements for comfortable sty. I believe every year many families book their rooms for a month or so and stay at the temple complex. Per room the rentals are Rs.250/ per day only. In which food is free, electric fans are there in each room and rooms are clean. Nag Bal is situated in Anath Nag City. The meaning of Anath Nag is (An-ant=un-ending, Naga=Springs) Unending springs. 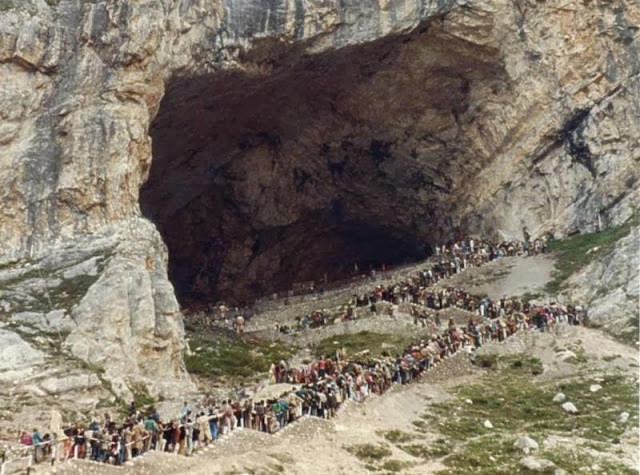 According to ancient mythological stories, the name Anant Nag is given to the place because Lord Shiva during his journey to Amarnath cave left all his valuables on the way and Anant Nag was the place where he is supposed to have left countless number of serpents residing on him. Now one more temple complex of Lord Rama, is come up within the compound complex of Nag Bal. This Lord Rama temple is just adjutants to Sulphur spring. This temple complex is constructed in phases, during militancy, first phase started by senior Swami ji, SWAMI MADHAV DASS JI and then continued by Junior SWAMI GANESH DASS JI. 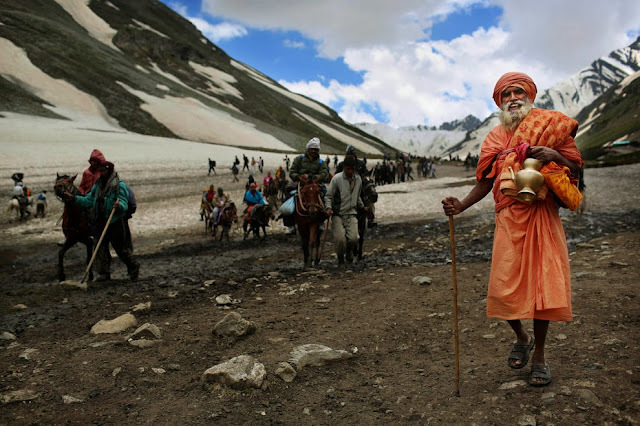 Later Senior swamiji was kidnapped by militants asked him to run away from Anath Nag city. Since he refused to listen to militants, they tortured him ,starved him and even tied him up side down, but in vain. Then some how, some influential local Muslims approached the militants and requested them to release him. Once he was released, he was to week, to walk, to talk or to eat. After some time he died. Then his junior Swamiji SWAMI GANESH DASS JI took over the management of the temple. Even he was threatened by the militants, but some how militants let him continue. He is still there in the temple, and he is now expanding the construction of the Ram Temple. He has constructed a big three storied building. On all the two floors he has established Idols of Nav-Durgas and on the top floor he has constructed about 20 feet tall cemented beautiful Huge “shiv-Linga”. Since he is running short of funds to complete his project of the temple. I request all my blog readers as well as the rest of KP, if possible please donate libererly. The Mobile contact number of the temple are 09018912732 / 09086226612 and the Lan line No. is 01932-223400. On July-2013, my elder brother G.L.Parimoo and me spend nearly three hours with the present swamiji SWAMI GANESH DASS JI and we clicked almost whole Rama Temple complex pictures. We even had Lunch and Tea with Swamiji and patiently listened to his preachings. About the torture of the senior swamiji SWAMI MADHAV DASS JI by the militants were narrated to us by the present swamiji SWAMI GANESH DASS JI. Shakti Peethas are shrines or divine places of Shakti formed due to the falling of body parts of the corpse of Sati Devi, when Shiva carried it and wandered throughout Aryavartha in sorrow. There are 51 Shakti Peeth linking to the 51 alphabets in Sanskrit. Each temple has shrines for Shakti and Kalabhairava. Sharada Peeth is one of the 18 Maha Shakti Peetha. Devi's Right hand is said to have fallen here. The Shakti worshiped here is the goddess of knowledge and education, Saraswathi otherwise known as Sarada. The mythology of Daksha yaga and Sati's self immolation had immense significance in shaping the ancient Sanskrit literature and even had cultural impact in India during olden times. It lead to the development of the concept of Shakti Peethas and there by strengthening Shaktism. 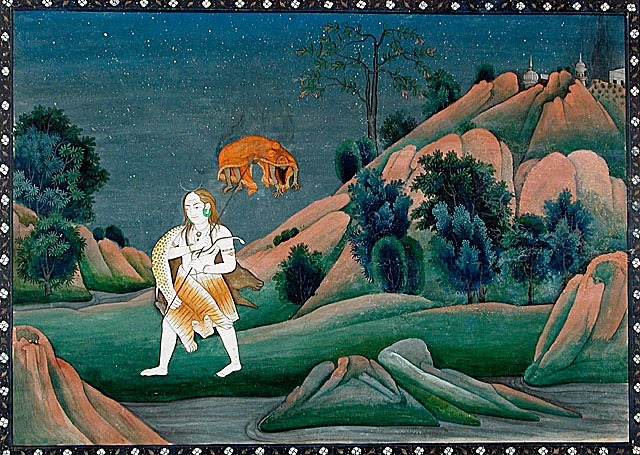 Enormous mythological stories in puranas took the Daksha yaga as the reason for its origin. It is an important incident in Shaivism and Shaktism. 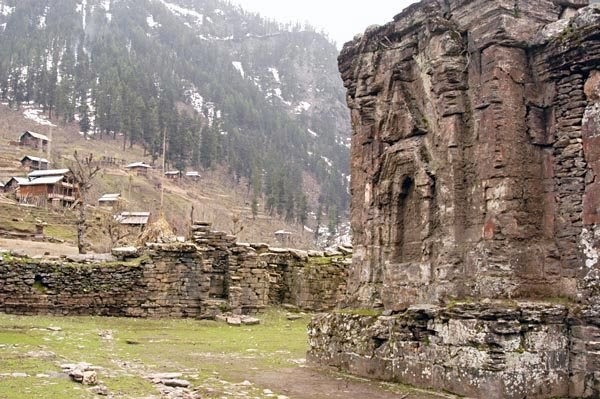 The temple is located in a village called Sharda in Neelam Valley, at a distance of 60 miles from Baramulla and about 16 miles from line of control. The place was once a celebrated centre of learning in the subcontinent. It was a centre of great Sanskrit scholars and Kashmiri Pandits and was a famous centre of Hinduism and Buddhism. According to the Prabhavakacarita, a Jain historical work dated 1277–78, the Śvetāmbara scholar Hemachandra requested grammatical texts preserved here so he could compile his own grammar, the Siddhahema. The Vaishnava saint Swami Ramanunja traveled all the way from Srirangam to refer to Bodhayana's vritti on Brahma Sutras preserved here, before commencing work on writing his commentary on the Brahma sutras, the Sri Bhasya. Near Sree Sharada Devi temple, there used to be famous Sanskrit university. 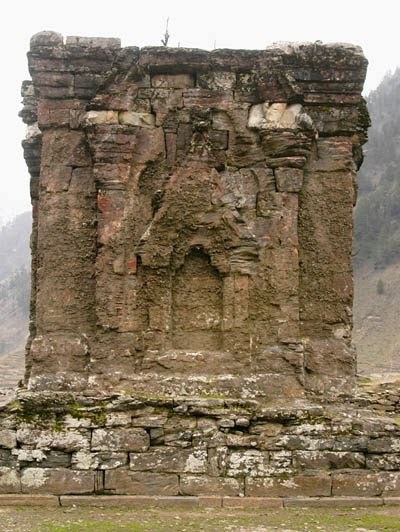 The temple is so ancient that Kashmir State was earlier known as 'Sharada Peeth'. It is at this temple that received the right to sit on the Sarvanjnanapeetham or Sarvajna peetha(Throne of Wisdom).The temple is at a height of 11000 feet above the sea level and is about 70 miles from Shrinagar. The length of the temple is 142 feet and width is 94.6 feet. The outer walls of the temple are 6 ft. wide and 11 ft long. And there are arches with 8 ft. height. It is a very good example of architecture. The Śāradā image at Shringeri Sharadamba temple was once said to have been made of sandalwood, which is supposed to have been taken by the Shankara Acharya from here. In a poetic work composed by Mahakavi Kathana in the year 1148 CE, there is a mention of Sree Sharadad Devi temple and its geographic location. 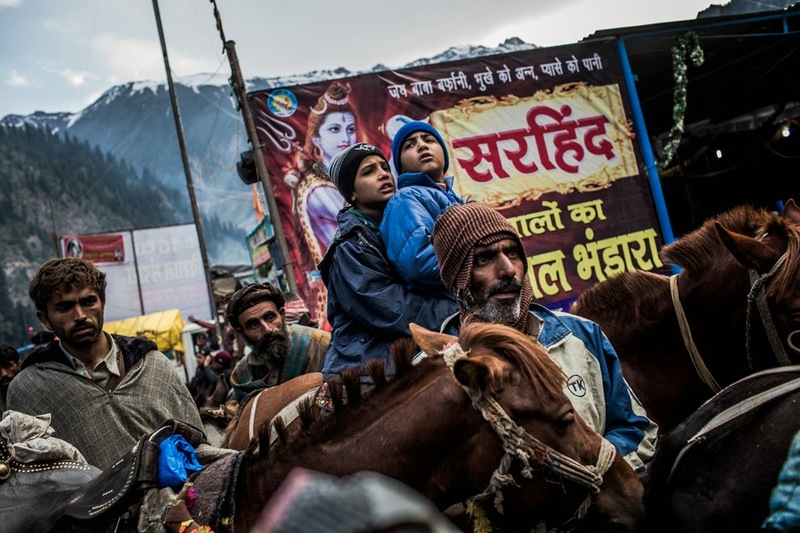 Kathana mentions that in Lalitaditya’s reign (8th century AD), some followers of a king of Gauda (Bengal), come to Kashmir under the pretence of visiting the shrine of Śāradā.The first verse of 'Prapanchsar' composed by Adi Shankaracharya is devoted to the praise of Sree Sharada Devi. During 16th century, when Akbar was ruling at Delhi, Abul Fazal, one of the famous 'Nava-Ratnas' in his Court, has written about Sree Sharada Devi temple that Sree Sharada Devi temple is near the banks of river Madhumati (currently Neelum river) which is full of gold particles and he also wrote that one can experience miracles on every eighth day of the bright fortnight of the monthIn the 14th century, the temple was attacked for the first time. 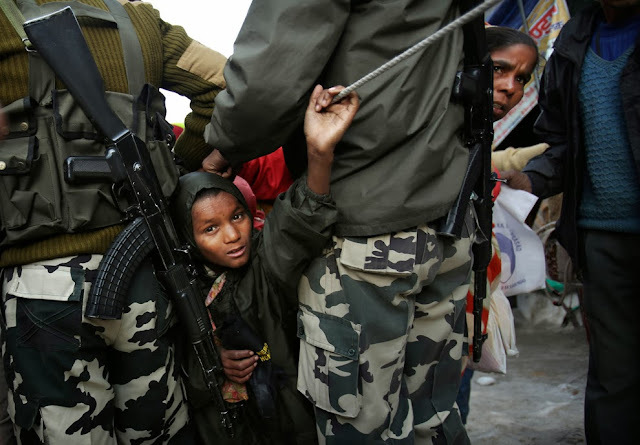 After this attack, India started losing its contact with Krushnaganga and Sharada Peeth. 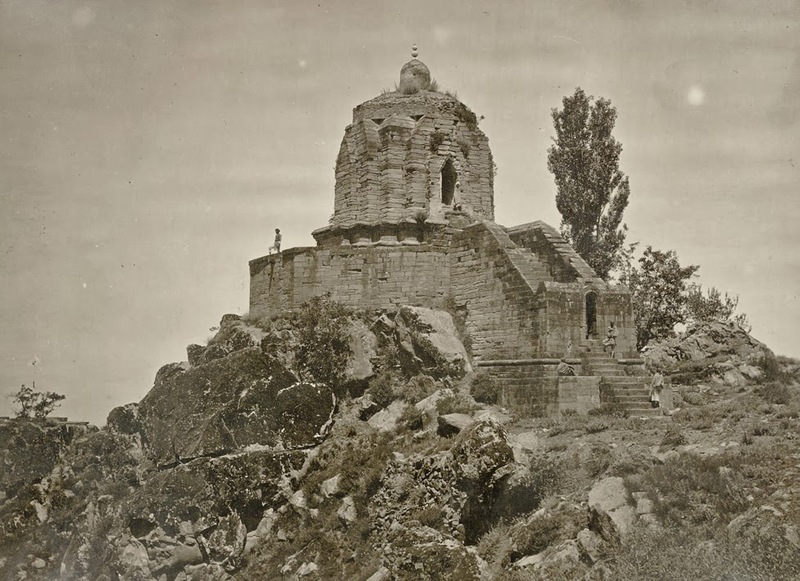 In the 19th century, Dogra king of Kashmir restored this temple. Many ancient holy books of Hindus were written in Kashmir. 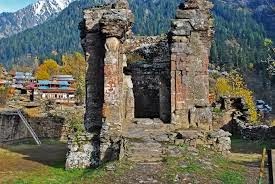 From the time of Sage Sandhya, Kashmir was renowned for Sanskrit language, literature, astronomy, astrology and jurisprudence so also as a well-known centre of arts and architecture. In the 8th century, King Lalitaditya ruled Kashmir. During his time, Kashmir was known as the centre for studies of Hindu religion. There is a mention in the 'Sankhyayan' written by Vinayak Bhatt that in those days, Hindu students use to go to Kashmir for higher studies. In the writings of famous Chinese traveler Yuan Shuang in 7th century, it is mentioned that many saints and scholars lived in Kashmir. Matang Sage Shandilya used to meditate in Sharada-van. Near the temple of Sree Sharada Devi, there is 'Amarkund' lake. It is believed that Sage Shandilya got the 'darshan' of Sree Sharada Devi there. Superb work Ashok, A whole of lot of Kashmiris owe you a debt of gratitude for this great effort. Thank you Vijay, I am touched by your honest sentiments..
Planning to visit Kashmir later this year so good to have this background information. Would like some information, I visited Shrinagar many many years age and on a bus tour to Gulmarg visited a temple where the priests kept family history records. Would you know this place as I would like to take my children there. Many thanks for making the sincere effort to explain THE MOST POPULAR TEMPLES OF KASHMIR. I feel fairly strong about it and would like to read more. If it's OK, as you find out more in depth knowledge, would you mind writing more posts similar to this one with more information? Thanks for the nice blog. It was very useful for me. Keep sharing such ideas in the future as well. This was actually what I was looking for and I am glad to come here! Thanks for sharing such a valuable information with us..
We are offering best of Kashmir Tour Packages At Very Lowest Rates. For more information, Please Visit our link..
Kashmir such a very beautiful place in India. Really amazing and beautiful pictures. India is a very nice country and many tourist destinations to see and know about India and Kashmir is one of best Tourist Place india. Very nice information for traveler ..thanks a lot for sharing this information.Thanks a lot for giving proper tourist knowledge and share the different type of culture related to different places. Bharat Taxi is one of the leading taxi and Cab Services provider in all over India.